My name is Steve Smith. I grew up on a small cane farm in the Seaforth area about 40 km north of Mackay. While continuing to live in this area, I’ve worked as a tradesman and design draftsman in both the sugar and mining industry. I currently work as an operator on shift at Dalrymple Bay Coal Terminal. Growing up on a cane farm in my earlier days I gained a fair amount of experience with fire, both as a tool in farming and as a foe when things get out of hand. 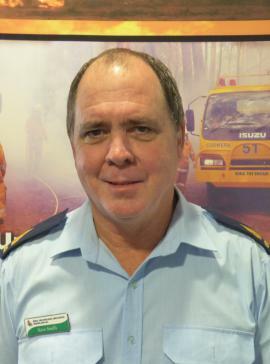 In 1998 I took on the role as Fire Warden of the Seaforth District Brigade area. At that stage our brigade was a primary producer brigade, but had a need to progress as we had a growing number of residents chasing the rural escape. In 2003 I also took on the role of 1st Officer from brother Don. I could see the need to pass on the knowledge and skills gained in the cane industry to other community members, so we conducted regular training sessions, controlled burns and training runs. Since then our brigade has steadily grown to have our own shed/station, office, training area, medium attack and recently a UTV support unit. Our current members not only include the farmers, but accountants, nurses, posties, office workers, cafe owners, shift workers and retirees. Our brigade works with our neighbouring brigades as well as being deployed to areas like Mount Britton, Nebo, Biloela, Townsville, Midge Point, Sunny Side to name a few. As a RFI trainer, I’ve assisted the Area Office in FMS and Crew Leader courses. I’ve also assisted at the Incident Control level at some of the larger events, notably Midge Point 2015, Junee State Forest, Redcliffevale and Mia Mia in 2014. I was recently involved in a project to develop a UTV support unit which we ended up using the Kawasaki Mule, which became Seaforth District 35. So far it has proven to be very useful and has improved crew safety. This prototype is now being used by other brigades state wide. My philosophy is still the same: Whoever owns the fuel owns the fire, and a Rural Fire Brigade is all about neighbour helping neighbour help themselves. I am in my brigade so I have someone to help me manage my fire risks.